'12th Man' committee members Philip Simpson and Darren Archer present a sponsorship cheque for Saturday's game to United chairman John Taggart. Picture: Damian McKee. 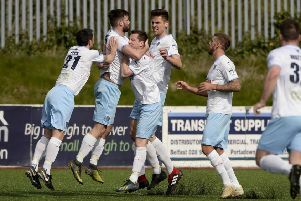 The first draw in the new Ballymena United supporter-led initiative “The 12th Man” took place recently with a £500 prize pot split between three lucky winners. The draw took place on the pitch at half time during the fantastic Boxing Day derby game against Coleraine, when it was also announced that the initiative had reached the golden 100 member mark, resulting in an extra prize of a WASP Solutions League Cup Final ticket! Prizewinners in the inaugural draw were: First prize (£250) - John Murray; Second prize (£150) - Scott Johnston; Third prize (£100) - John Barratt; 100th Member (Free WASP Solutions League Cup Final ticket) - Johnny Willighan. The first proceeds from the initiative were pumped back into the club when ‘The 12th Man’ were the match ball sponsors of Saturday’s game against Glenavon. The 12th Man is a subscription based fund whereby members will pay £10 per month into a bank account by standing order. Half of these funds are given directly to the parent club, Ballymena United FC, the other 50% distributed as cash prizes as described above. The next draw will take place at the end of January, and the prize pot will be announced beforehand. You can sign up via a number of ways - by downloading the Standing Order Form via the BUFC Club website at 12th Man Form and post it to the address on the form. More details are available via ‘12th Man’ committee members Philip Simpson, Iain Black, Matthew Armstrong and Darren Archer on 07734591769.